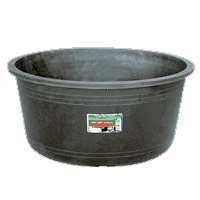 Available in: Several sizes from 8-24 quart, and in several colors. 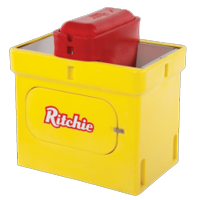 Durable, impact-resistant portable feeder with molded-in bracket that hooks over any 2-by-wide board. Stackable for carrying or storage. 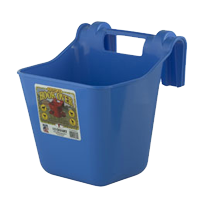 Convenient handle for carrying one or more feeders in one hand. 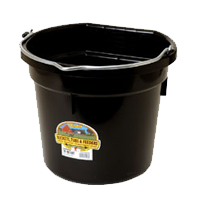 Available in: 12 and 15 quart sizes, and in several colors. 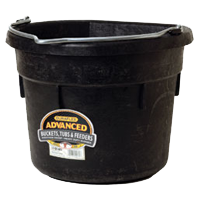 Flat-back bucket fits more compactly for hanging, makes hauling heavy loads easier. 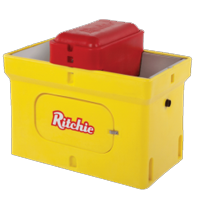 Stacking ribs allow buckets to pull apart when stacked, finger grips for easier pouring, graduation marks for measuring. Crush-proof, crack-proof, freeze-proof DuraFlex corded rubber. Heavy-duty steel handle with rugged eyelet and handle connection. Available in: 8, 12, 18 quart. Available in: 13, 25, 37, 54, 160, 180 gal. Heating elements are located directly under the 304 stainless steel trough for exceptional performance and overall heat coverage. Cable heater provides extra valve and supply line protection. Insulated with highly energy efficient polyurethane foam, providing an r-factor of 7 per inch. Durable insulated casing allows for energy efficiency. Water between 100 beef/50 dairy. OmniFount units are sold complete and ready to attach to your water and electric lines. Heating elements are located directly under the stainless steel trough for exceptional performance. Water between 150 beef/75 dairy.